There is mounting evidence that Academisation is failing. Recently the South Shore Academy in Blackpool was blasted by OFSTED as inadequate. This is sponsored by the Bright Futures Academy Chain. Schools are being forced to convert to Academies against the will of parents or staff. Clive Lewis (Labour MP, Norwich South) has opposed the plans of Inspiration Trust Academy Chain to takeover the Hewett School in Norwich. Who is sponsoring the Academisation of schools? The Guardian list. Today is the last date at which evidence can be submitted. The Public Bill Committee for the Education and Adoption Bill has requested written evidence. This Committee’s stops accepting written evidence today (14 July). Teachers know that controversial announcements for changes in education policy are always buried in the summer holidays. The powers-that-be think it will be all forgotten by September. Henry Stewart, Local Schools’ Network has collated data which shows very clearly that schools which are sponsored academies are much more likely to subsequently be found inadequate following OFSTED inspections. The data currently is confined to sponsored academies in the secondary sector because there is currently insufficient data from primary sponsored academies to collate significant results. But there is no reason to suppose that this would indicate a different trend. “Converter academies, schools that were already Good or Outstanding, do not appear to have the same problem. 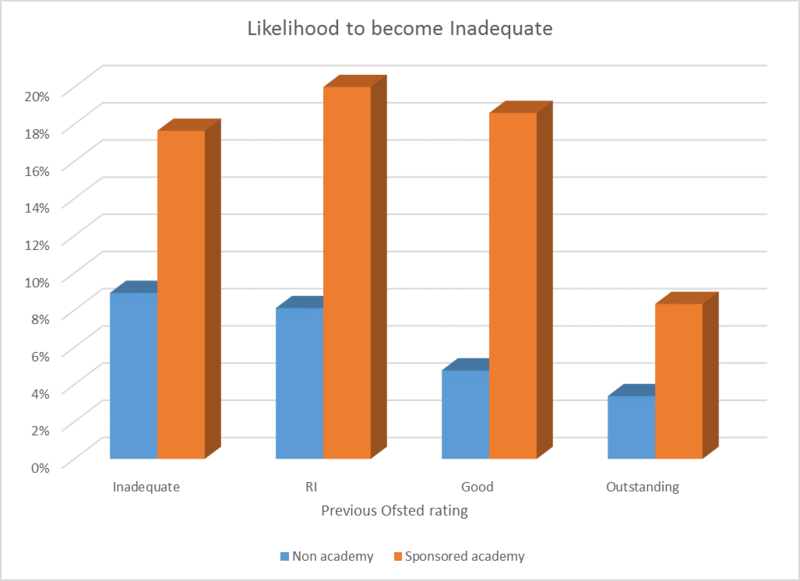 The higher likelihood to stay or become inadequate is specific to sponsored academies. However this is the academy model that is being proposed for “inadequate” or “coasting” schools under the Education Bill. The evidence seems to indicate that, in terms of Ofsted rating, a school is more likely to improve and less likely to stay or become inadequate if it is not a sponsored academy. This may be because most sponsored academies are part of academy chains, whose problems are clear from DfE data. With only 4 of the 20 biggest chains showing above average results, in terms of value added, the solution of giving an “underperforming” school to a chain needs to be closely examined. These findings match those of the National Audit Office which found informal interventions such as local support for schools in difficulties were more effective than formal interventions such as academy conversions. Clearly, the agenda to date has never been about improvement in schools, and even more worrying is, because of that there is little concern for the children and individuals whose lives are affected. It has always been ideological, about privatisation. The conflict of interest engendered by whole scale privatisation is evident. Competition between schools results in their isolation, and centralised services supporting special needs such as CAMHS , SEN, home tutors are lost. Schools work better in LEAs or teacher managed consortia, not privatised businesses. Guardian: Who is Sponsoring Academy Schools? This entry was posted in Children and Youth, Education, Government policy, Privatisation, Propaganda, Topical News and tagged academies, Education, privatisation by Pamplemousse. Bookmark the permalink.